We’re rolling into February with love, romance, amour on the brain…whatever you like to call it, we’re ready to spoil the ones we love. From your gal-entines to your main squeeze, Homefest has great gifts for the loved ones on your list. Shop our Valentine’s Day gift collection for our favorite inspired and unexpected gifts. Arm Candy: Jewelry, they don’t call it a girls’ best friend for nothing. Our gorgeous collections from Julie Vos, Girl with a Pearl, and Bloom jewelry* will make her heart swoon. Let’s Get Personal: From bath bombs to body balms, our luxe personal care collections are sure to be her favorite indulgence. 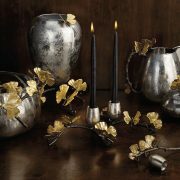 Home is Where the Heart is: Romantic notions for the home, like an elegant Simon Pearce bud vase filled with her favorite stems or the heart trinket bowl from Michael Aram, are the perfect way to say je t’aime. Gifts for Him: Our men’s department is stocked with the best in barware, men’s grooming products, specialty tools, and more. Give the gift of great grooming with no-nonsense (and hilariously irreverent) products from Duke Cannon or superior skin care for the dapper dude from Jack Black. Stir something up this Valentine’s Day for the cocktail connoisseur. From handsome barware and decanters to dirty martini juice, even he’ll embrace the holiday with a steady flow of booze. Multi-tools for every occasion. Whether he’s an outdoorsman, a sports enthusiast, or a handyman, these tools are crafted to combine style with function.